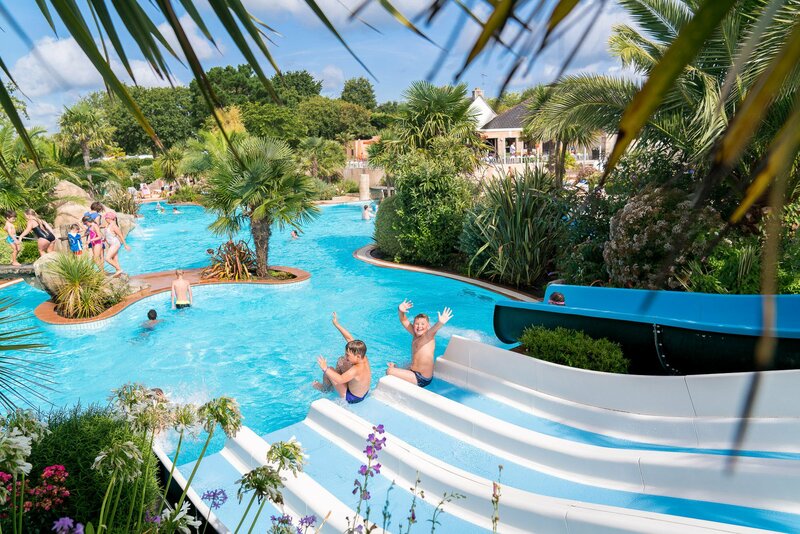 The aquatic park of the Le Letty campsite,a tropical wonder in Brittany. Here there is air of the Caribbean in Brittany! L’Aquatropic, the aquatic park of our campsite, does not have this name purely by chance! 3,500 m² of heated pools and beaches amidst lush vegetation. 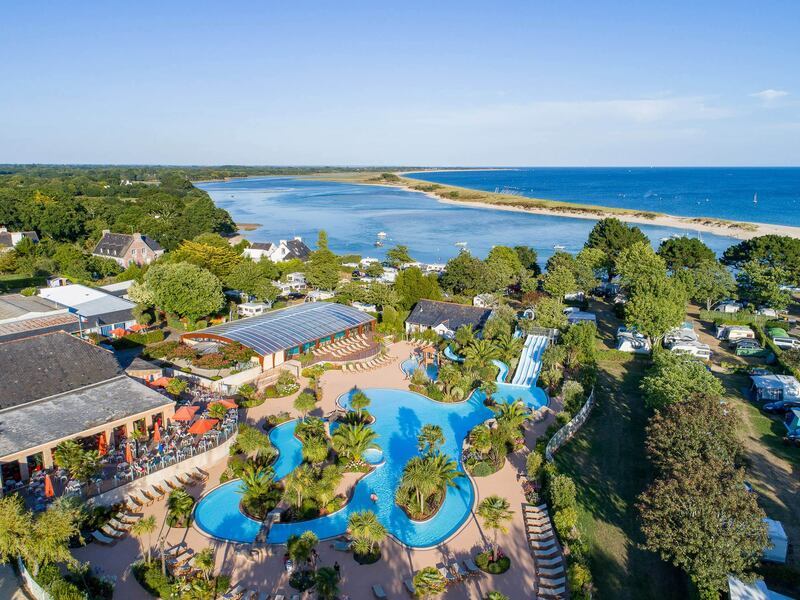 Discover an aquatic park in the very grounds of our Bénodet campsite. With its 800 m² of heated pools and its aquatic slides, the l'Aquatropic aquatic park is both unique and magical! Opposite the sea, at the heart of tropical lush vegetation, the turquoise waters of the lagoon inevitably remind you of the Caribbean! With its twisting multi-slides, its waterfall, its artificial river for swimming in a counter-current, its jacuzzi, its stream of bubbles and its hydromassage jets, you will dive into a universe of pleasure but also one of unwinding and relaxation. Around the vast beaches equipped with sunbeds, palm trees and multi-coloured flowers will provide you with a total change of scenery. 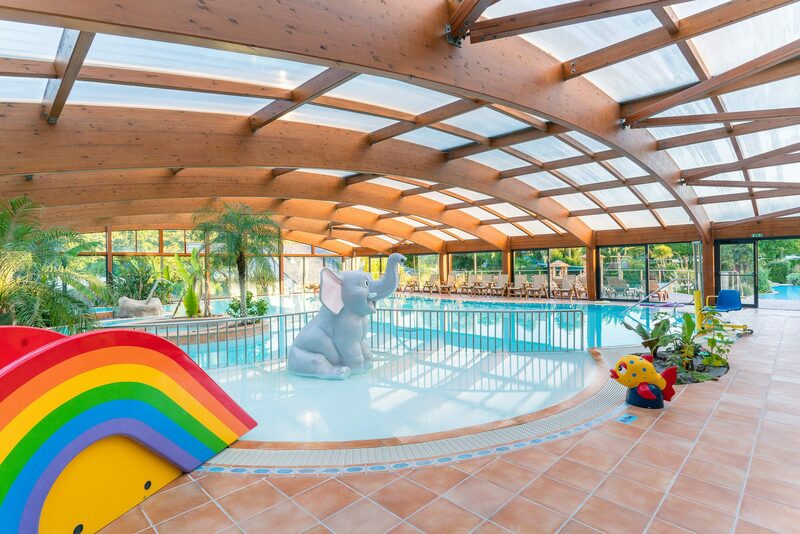 For your comfort, the aquatic park of our Le Letty campsite has a large indoor swimming pool heated to 29°C. This is equipped with changing rooms and the very young will be able have fun in a paddling pool equipped with multi-coloured water games. Whatever the weather and the forecast on a given day, you are sure to spend delightful times in our Breton campsite, given that it has an indoor swimming pool. Dive into the into the turquoise watersof the lagoon. Make the most of the aquatic park with your children! For the greatest delight of the very young, the aquatic area of the Le Letty campsite has a large well-equipped paddling pool: a mini-water slide, a waterfall, a water cannon, a cabin, mango pourers and many other games for children’s pleasure. Sunbeds and chairs placed near the paddling pool enable you to watch over them. In the indoor swimming pool, the very young will have fun in a paddling pool equipped with multi-coloured water games. Please also note that from Monday to Friday, free aquaerobics is offered to you during your camping holiday. The rules for use of the aquatic park are displayed at the entrance to the latter. For your own well-being and that of other holidaymakers, please abide by these. Wearing a bracelet is compulsory. This will be given to you when you arrive at the campsite. You are obliged to wear this for the duration of your stay. Moreover, swimming shorts are banned in the swimming pools. Our lifeguards in the aquatic area ensure that you abide by the rules for the aquatic area.